I won't lie. Lagers have never really been my thing. Maybe it's because I drank entirely too much fizzy yellow stuff in my misbegotten youth and mass-produced adjunct lagers just ruined the flavor profile for me. However, we're capricious and whimsical here at Kaedrin, and as a result, I've had a couple of great experiences with lagers in the past month or so. Experience the first: At a local beeratorium, I tasked some friends with purchasing me a beer and not telling me anything about it. I made a pitstop, and when I came back, they gave me a glass filled with pale liquid. I sniffed it and immediately pegged it as a lager... but it turned out to be Captain's Kolsch (not technically a lager, but it certainly shares a flavor profile) and I genuinely enjoyed it (may review it sometime, but don't hold your breath). Experience the second was a glorious pint of Pivovar Kout Koutská 12° Dvanáctka from Operation Chowder. I mean, I'm not completely abandoning my typical rotation of Saison/IPA/Stout in favor of lagers and Kolsches, but it's nice to change things up every once in a while and get out of your comfort zone. To that end, when in Vermont for Operation Cheddar III: Cheddar Harder, I took a flier on this Pilsener (or is it a Keller Bier? The label sez both!? Gah!) 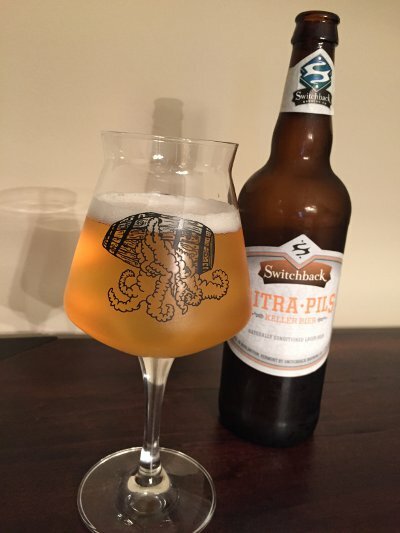 from Vermont stalwarts Switchback brewing. It starts off as a pretty typical Pilsener; lots of pale malt and Saaz hops. The curve ball here is that after the traditional 6 week lagering period (i.e. cold conditioning after fermentation), Switchback dry hopped with Citra and more Saaz. The result is a nice little compromise between an IPA and Pilsener, well worth checking out if you get the chance, even if it won't make you fall down and see God. Beer Nerd Details: 5% ABV bottled (22 ounce bomber). Drank out of a teku glass on 6/19/15. No date on bottle, but it was first sold in May 2015, so this was reasonably fresh. I enjoyed this more than their normal flagship Switchback Ale, and would love to check out more from these folks. Perhaps we'll snag something during the imminent Operation Cheddar IV: Smoked Cheddar. This page contains a single entry by Mark published on June 23, 2015 7:57 PM. Lost Nation Gose was the previous entry in this blog. Jack's Abby Framinghammer(s) is the next entry in this blog.